For most travellers, and all merchants, the road from China to India lies as it has lain for centuries, through Singkiang along that ancient Silk Road which is the most romantic and culturally the most important trade route in the history of the world. In 1935 Peter Fleming set out to travel that route, from Peking to Kashmir. It was a journey which swept him and his companion 3500 miles across the roof of the world. It took them seven months to complete the journey. They travelled across deserts and mountains, through ice and sand and into some of the most beautiful, mysterious and dangerous areas in the world. His account of that journey is filled with endurance and adventure, with strange encounters in the wilderness, with tales of Chinese, Mongol tribesmem and Indians, and with a spirited sense of humour and courage. I am an avid reader of travel books and sadly, albeit Fleming is an accomplished writer, this just didn't hit the mark for me. It was more of a meander through a region, of minimal eventuality, rather than anything of real substance. I would not go as far to say I did not enjoy the book. Metaphorically it was more like lying in a gentle steam, not unpleasant, as opposed to standing under a waterfall, exciting and invigorating. As with most matters of taste, one concedes, this is a purely subjective assessment. BRILLIANT IMPRESSIONS OF A WORLD LONG GONE. Read the story and be amazed by the fortitude and resourcefulness of the four travellers and rejoice when they finally reach their destination. Definitely a must read for anyone interested in travel and adventure nearly 80 years ago and marvel at how they all survived. Would you listen to News from Tartary again? Why? What a slog... I felt each elbow in my back as we squeezed into the back of the lorry from Xian. I was thirsty from the dryness of the plateau and riding with the prince was another test of endurance, And then we got to the squalor and distress of the camels and horses from oasis to oasis on the way to Kashgar. I am still emptying the sand out of my ipod. Then the blood splattered on me as they pierced the noses of the horses on the pass over to India ... Peter Fleming's concern for the plight of the animals, his growing contempt for the dishonesty of the local "guides", and his generous praise of his traveling companion all brought to vivid life this moment in history. What other book might you compare News from Tartary to and why? Colin Thubron's Shadow of the Silk Road travels some of the same route in 2003 and is a fabulous listen, also full of back stories. What does Richard Mitchley bring to the story that you wouldn’t experience if you just read the book? Accent that anchors the point of view, and great pacing that deftly moved me from event to event. Would you consider the audio edition of News from Tartary to be better than the print version? I would not say so, it is more like they complement each other. 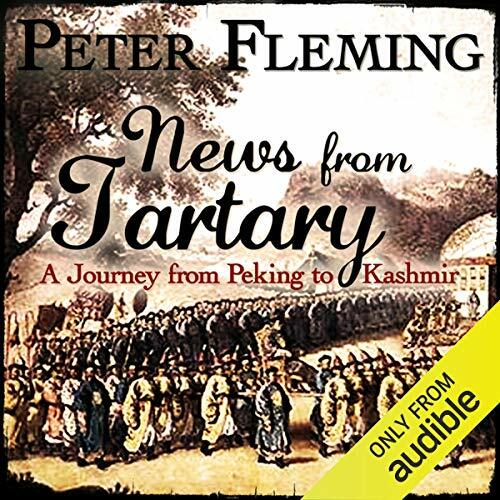 I have read nearly all Peter Fleming's books (and I like him considerably more than his famous brother) but listening to those stories - especially narrated that well - is a separate and new pleasure. Various succinct and funny - nearly comic opera - descriptions of small caliber Asian and Chinese officials. At times one feels like listening to a part of a Gilbert&amp;amp;Sullivan libretto. Never had time for that, but it was a pleasure anyway. Richard Mitchley did a very good job. Exactly the kind of voice and attitude Fleming's books demands. Lovely narration. Will have to hunt for more by this narrator, love the voice and manner.